Garcinia Cambogia is a tree, native to Southeast Asia, which produces fruit prized for its culinary and beneficial purposes. 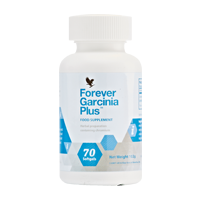 As well as the fruit’s extract, Forever Garcinia Plus contains chromium which contributes to normal macronutrient metabolism and the maintenance of normal blood glucose levels. N.B. Contains soy. Take 1 softgel approximately 30 - 60 minutes before meals, 3 times daily. Garcinia (Cambogia fruit extract), safflower oil, gelling agent (gelatin), emulsifier (glycerin), medium chain triglycerides, water, thickener (beeswax), carob extract (carob fruit extract, corn syrup, colour (caramel), emulsifier (soy lecithin), colour (titanium dioxide), chromium picolinate. Allergy advice: For allergens, see ingredients in bold.